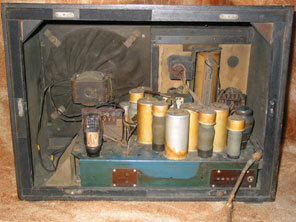 Shown in these pictures is the Murphy A50. This set is not one of R.D. Russell's most captivating designs, but at about 2 feet long at 18" high it is massive, and looks impressive in real life. The AC4/PEN output valve is more powerful than that fitted in the receivers shown above, and can deliver almost 7w. The output transformer is also a noticeably "meaty" component that delivers very good sound quality into the 10" loudspeaker. Felt has been applied to all the edges where the back panel meets the cabinet to reduce the chances of vibration. 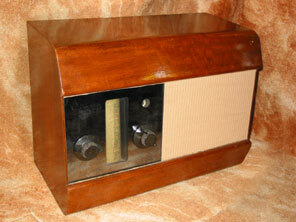 This receiver features the smoked mirror tuning escutcheon first seen in the A40C, together with a mahogany cabinet. Valve line-up is AC/VP2, AC/TH1, AC/VP2, HL41DD, ME41, AC4/PEN, UU4.